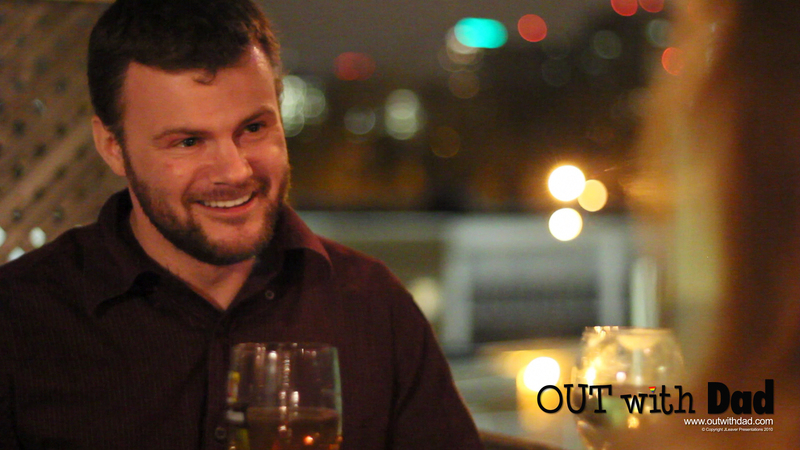 We officially started shooting “Out With Dad” this past Saturday, April 10. The last time I had been on any sort of production set was last September when I was in another of Jason Leaver’s intriguing projects called Mobius. I arrived late in the afternoon on Saturday, as the scene I was in took place in the evening hours. When I arrived, as with Mobius, the set was busy with people determined to put on film a story that would feed your mind and captivate your being – and look good too! However, unlike Mobius, the cast and crew were largely expanded. Each person with a job to do and inspired to do that job to perfection and at the helm steering the “Out With Dad” ship was Jason Leaver. They were still in the middle of filming a scene with Kate Conway, Lindsey Middleton and Corey Lof when I arrived. There were a few extras in the scene and all crew necessary were present and preoccupied with the job at hand. Even a few supporters such as Jason’s wife, Natalie were there offering whatever help they could. I had arrived early for 2 reasons; first because I just couldn’t wait to get started and was too excited to sit around waiting all day and wanted to be around my fellow cast and crew members that I’ve gotten to know over the weeks in pre-production (they really are the best you could hope to work with), and secondly to be in some photos for “Rose’s 15th birthday” to be used in the series. Being the self proclaimed goof ball I am, I spent most of the time until the scene I was needed in just being that until we got started. Makes me feel good as it always has to make people laugh and lighten the mood, when it’s appropriate that is…ok that’s a lie…when it’s not appropriate is much more fun. I ran my lines with Kelly-Marie Murtha and while doing that, it started to rain, which wasn’t good news considering the scene was taking place outside and Jason told us we may have to cancel. No way. I’d have waited all night to shoot this scene. I was ready and I was excited. But, it wasn’t my call. Fortunately though, the rain subsided quickly and we were able to get started after a quick bite to eat. 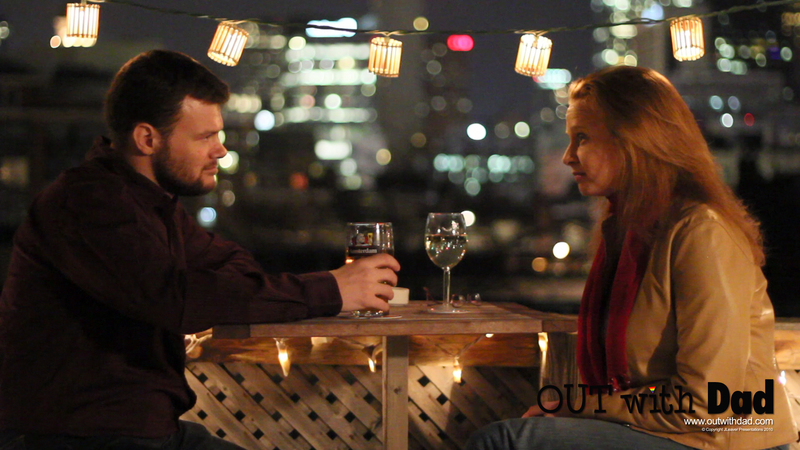 The set was a perfect roof-top patio-bar for our characters to get to know one and other. We got down to business. The first take went so well, Jason even said, “Wow! I actually have no notes for you two! That was perfect!” Boost of confidence!! BOOLYAH!!! That felt good to hear since I spent all week delivering my lines to my air conditioner. I’m going to admit something I previously thought I would not write about here, but what the hell. As confident as I am in being able to play the role of “Nathan” in Out With Dad, there was just a slight fear that has existed. 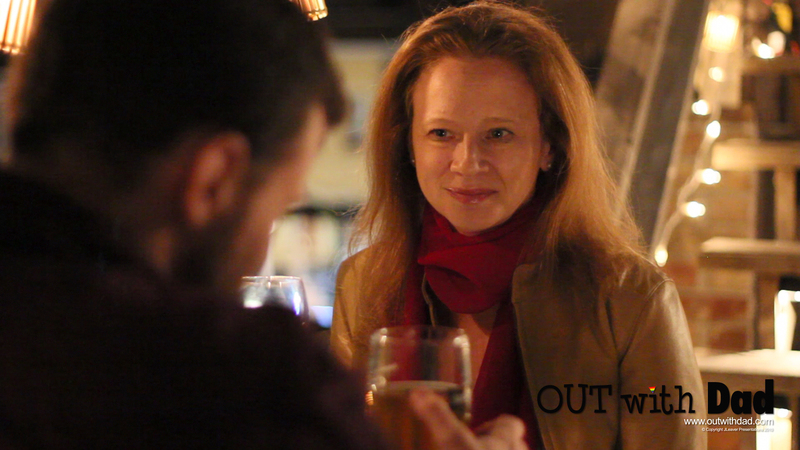 As far as I know, I’m the only one in the cast of Out With Dad with no formal drama training. The closest I have come to anything like that is doing stand up comedy and also pretending I’m interested when old people I don’t know start telling me about what’s wrong with their bodies when I’m in line to buy groceries. So, when I was cast my concern was to what degree I would be able to hold my own with a group of trained and clearly very talented actors. Not to mention a crew and a director who can tell the difference between a trained and skilled actor and one who is, well, not so trained, but hopefully skilled. I guess it was in the back of my head that it might appear obvious to anyone watching, whether it’s during filming, or after when the whole thing is put to the public’s eyes to feast on that I was the odd man out (in more ways than one) here. However, after doing the scene on Saturday night, I received so much wonderfully positive feedback from the crew that it has really boosted my confidence that I can hold my own with this gifted cast and crew. Don’t worry, my ego is well in check. For me it’s more about being able to give a performance that is worthy and complimentary to the hard work put in by Jason and the others involved. Also, I’m madly in love with this story and the characters, a feeling matched only by what I feel for my fellow cast and crew. As far as tackling Nathan’s character goes, basically I spent a lot of time studying the character inside and out, fusing what I imagine he would be like with fathers I know, fathers I liked in TV and movies and with what Jason imagined for Nathan. I also threw in a little of how I’d imagine I’d be if I were a father. For me, acting is about drawing forth the character within you. I believe we all have every character imaginable within us and the way I find that character within myself is the same way the artist Michelangelo would sculpt his masterpieces. When he was presented with a block of stone, he didn’t see a block of stone; he saw the image of the sculpture that was trapped in that stone. When he sculpted, he would say he was chipping away everything that was not that image. For me, acting is the same. I have all the characters in me already; I just chip away everything about myself that is not that character I’m playing. After that, it’s about the raw energy of the set and the people you work with. We all feed off each other, as we did Saturday night. It’s so much easier to do what you’re supposed to do when everyone around you is as passionate as our cast and crew is. Kelly-Marie, who I did my scene with, is a true professional who I felt completely comfortable working with. Eric, Kara, Rebecca, Lizz, Brendon and Natalie all made everything work like a well oiled machine and I’m so fortunate to know them all. The shoot Saturday night went smooooth as silk. We all had a great time. Despite the slight chill in the air, it was a beautiful night and I’m very eager to see how this all looks when it’s put together. And now I prepare for this coming weekend‘s shoot. I am filled with the promise of another great experience creating something that is truly wonderful working with extraordinary people. All in all my experience is that when acting in anything, you’re only as good as everyone else around you, cast and crew included, and, that being said, I can only hope I am as good for them as they are for me. I cant wait to start watching! I love the script! Jason you gotta send me some more when you get writing! When can I come out and meet the cast? So Amazing guys, I can’t wait to see it! Well written Will!